The fence functions here as a property line. Either you are in or you are out. It divides. Enjoy and keep on photographing fences! 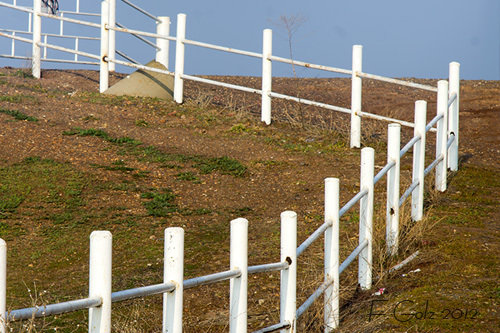 The photographic exercise for the coming two weeks is “Fence.” Fences separate, fences draw lines, fences also protect. Think about the function and purposes of fences and photograph them. As always, enjoy this exercise and be creative! 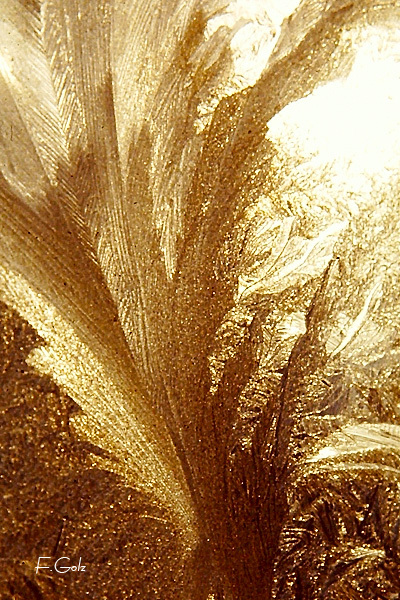 This is frozen water on a window photographed against the morning sun. This is a scan from a slide. I photographed this image as a teenager with my first SLR, a Minolta XE5. By the way, I still have the camera and I still use the lenses with a connector to my modern cameras. I believe I used the 50mm Minolta 1.4 prime lens to create this picture. This morning I went back to Lake Yosemite (a few miles outside Merced, CA) to look for some water images. 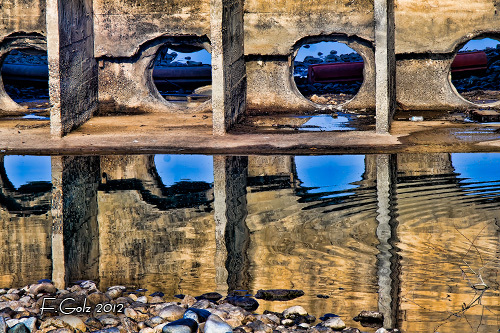 I photographed the water in front of the spillway. For the last couple of days I observed the water drops on my car. This morning I saw how the sun created all kinds of interesting reflections on my tail light. Normally I don’t like to photograph in direct sun light but sometimes you see a subject that exits you and you got to photograph it. By the way, the yellow color in the image is from my turn signal. 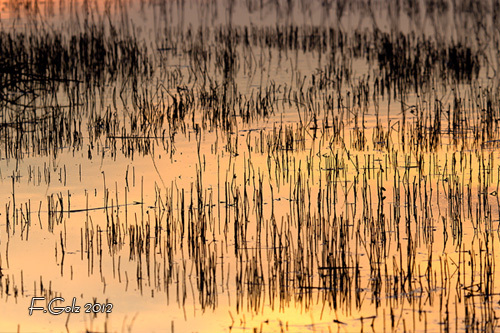 Enjoy, keep on discovering great image and photograph them. Yesterday I “discovered” my old hose and decided to use it for my water project. I wanted some reflection in the water and decided to use a flower which I also integrated into the background. I shot several images and decided to use this one. Take a close look at the white – green – orange combination in the water. This week I want to continue our “water” exercise. we had finally the first winter rain in the Central California Valley. 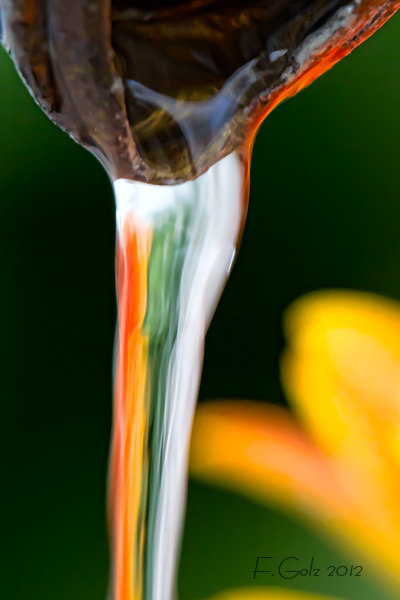 This opened up some great opportunities for photographing water. 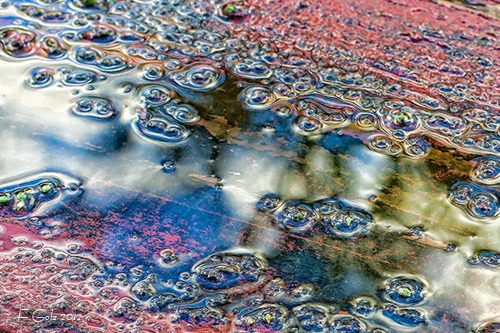 I found this water puddle on a wooden picnic table. I wandered around the table looking at the light reflection and took several shots. This one I liked the best. 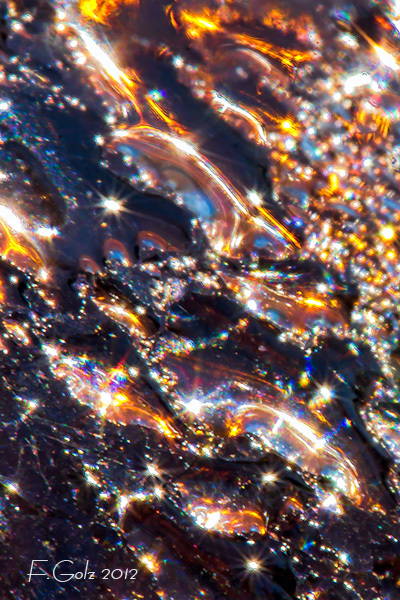 Water is highly reflective. I photographed the reflection of the sun in the later afternoon. The plants in the water added an interesting pattern to the image. It was so dark that the autofocus did not work anymore. I had to estimate the distance and adjust the lens manually. 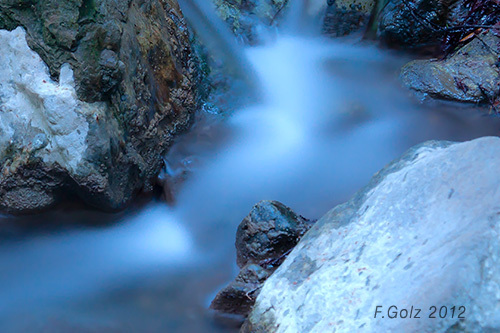 Normally I try to shoot flowing water at around 1 second exposure time if I want to create this very soft flowing effect. In this image the exposure time was 30 seconds at f5.6 and ISO 800. Of course I used a tripod in this image. 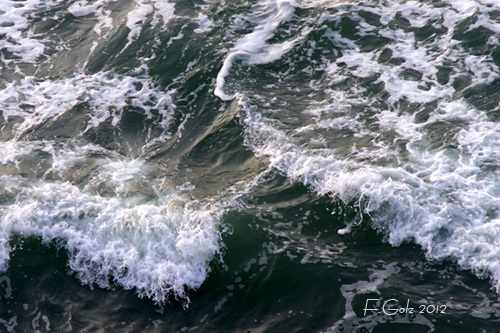 I photographed these incoming waves from the top of a balcony at the San Francisco Cliffhouse. I wanted to catch the dynamic of the waves and their fascinating energy.